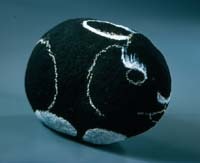 A smooth oval rock with a flat bottom works best. Makes sure it's clean and dry. 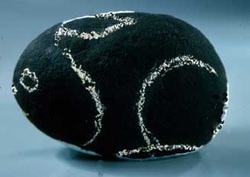 Cover the entire rock except for the flat bottom part with black paint. I use DecoArt Patio Paint in Wrought Iron Black because it is formulated to withstand weathering outdoors. Let dry. Use white chalk or a white charcoal pencil to create this simple design. Both sides should match, with eyes that are matching and level, The ears and facial features should be centered. 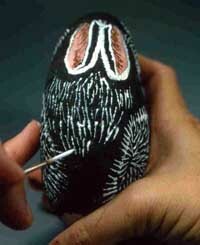 Switch to a bigger brush to fill in the feet and tail, Feather the edges to give them a furry look. Then use your liner brush to create delcate eyelash lines to frame the eyes. 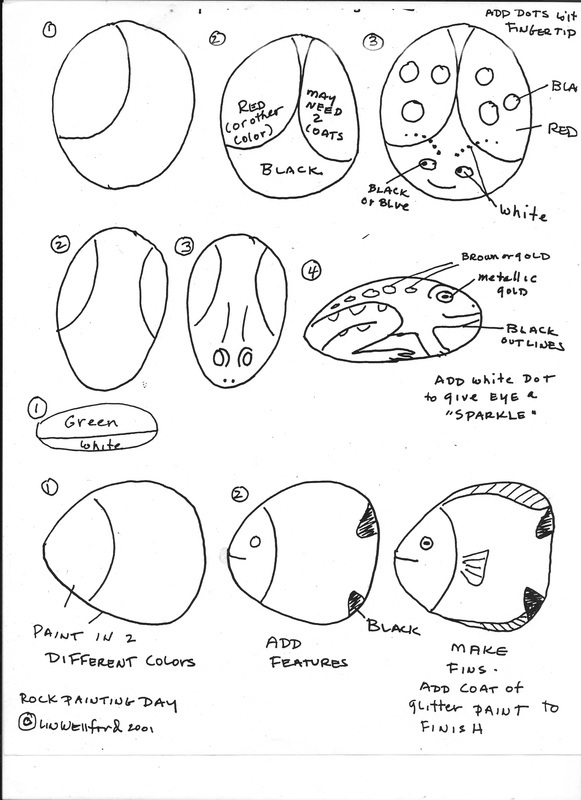 This illustration shows where to add color. Mix up a soft pink (white with a touch of red, then a smaller touch of brown) and fill in the ear centers and the nose shape. Use plain reddish brown to fill in the eyes, keeping them round and even. Then add more brown to the pink ear color and use a line brush to add shadows to the inside center edges of the ears. Use loosened white paint and a liner brush to create 'tiny splinter-like strokes that define the shape of the head on either side. Also add bottom eye lashes. Outline around both haunches as you did around the face, then begin filling both the cheeks and the haunches from the outside edges inward with overlapping rows of short furlines as shown. Overlapping fur creates a 'thatch' that keeps animals warm and dry. Once the cheeks and haunches are filled in with fur, begin filling in the backs and sides. Leave a narrow edge of black uncovered between all elements to keep them defined and distinct. Use the tip of your liner brush to add tiny fur lines to the muzzle and chin. Note that the fur on the face all radiates out away from the nose. Also note how leaving an edge of black showing helps to define the various features. Mix up some watery brown paint so that it is nearly transparent and use it to stain the fur here and there for a more realistic look. Avoid staining the outside edges of the head and haunch shapes because you want more contrast there, but use this stain to soften the look of fur on the sides and on the back, especially right behind the head, and in the forehead area. Use a tissue to blot and soften the stain if it gets too heavy. 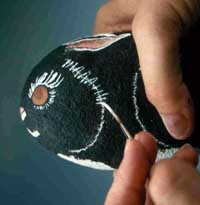 Switch to a liner and white paint to add three narrow whiskers as shown. Also add short whiskers to the inside edges of the ears. 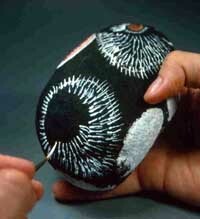 Use black paint to add a pupil that touches the top of the eye on both sides. Use black to redfine any fur that got too thick or to replace the defining dark spaces between features. 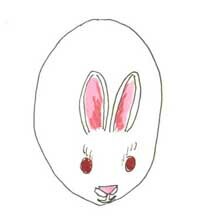 Finally, add a tiny dot of white to each eye, the 'sparkle' that will seem to bring your bunny to life! 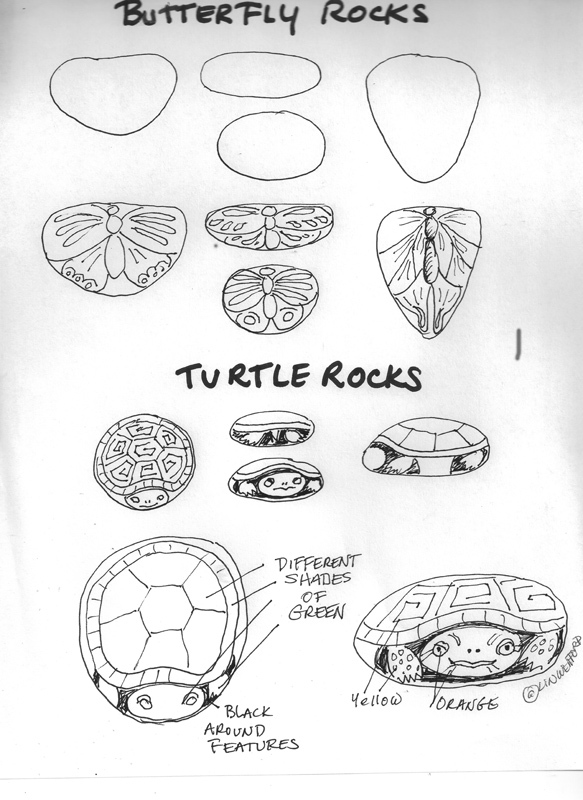 Look over your rock carefully to ensure that you have done enough fur. Never be afraid to paint over an area and redo it if you wish. 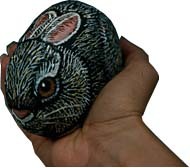 Rock painting is very forgiving and you get unlimited chances to get things just right. Once you are satisfied, use a Sharpie marker to sign your piece on the bottom and date it. Some rock painters also number each piece. I wish I had done this to know just how many rocks I've painted! You can use clear acrylic sealer to seal your rock. If you want to display it outdoors, be sure to use paint that is formulated for exterior use, and spray the rock all the way around, including the bottom, to keep moisture out.